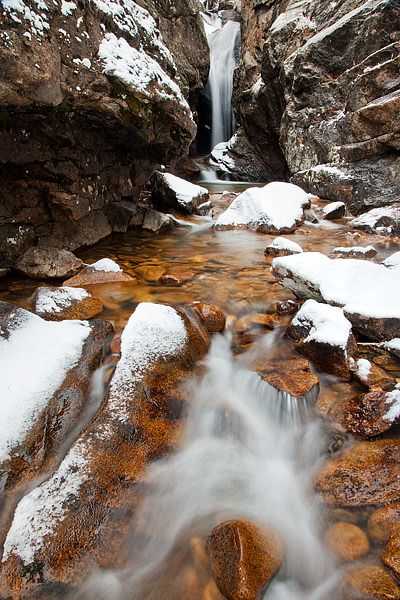 Snow falls on the granite that makes up beautiful Chasm Falls in Rocky Mountain National Park. While it's a cold day in Rocky, Fall River has yet to freeze over for winter. Chasm Falls is a popular stop for visitors to Rocky Mountain National Park in summer as Old Fall River Road passes near Chasm Falls. In the winter however, a hike is required to visit Chasm Falls. Compared to the busy summer seaons, visiting Chasm Falls in winter is a peaceful and solace experience. Photo © copyright by Thomas Mangan.